Scissor lifts are hydraulically powered aerial platforms used in a variety of maintenance and construction activities. To operate scissor lifts safely and avoid accidents, adequate safety training and a scissor lift operator’s certification are required. The Occupational Safety and Health Administration (OSHA) has set strict rules for workers who operate scissor lifts. An average of 26 deaths involving aerial lifts occur every year, and approximately 25% of these fatalities involve scissor lifts. There are many hazards associated with operating scissor lifts , the most common of which are falls and ejections. Wondering how to receive your scissor lift certification and avoid these hazards? Curious as to whether you need a scissor lift license to operate a scissor lift? You’ve come to the right place! Do You Need a Scissor Lift Certification to Operate a Scissor Lift? OSHA requires all persons who work with or near scissor lifts to be properly trained and certified. It’s the responsibility of the employer to ensure operators are correctly trained and competent to operate scissor lifts. Scissor lift training should include both formal and practical instruction, and needs to cover how to operate various types of scissor lifts, perform inspections, assess the environment and avoid accidents. Simply put, it’s impossible to place a value on the benefits you and your employees will receive from quality scissor lift training. In the hands of an untrained or poorly trained operator, scissor lifts can be extremely dangerous, causing accidents leading to worker injuries and damage to property and equipment. The best way to prevent these accidents is through proper scissor lift training, such as is offered by CertifyMeOnline.net. In addition to accident prevention, scissor lift training saves employers time and money through reduced damage costs and increased worker productivity. Becoming a certified scissor lift operator is the best decision you can make for your career. Scissor lifts are used on worksites across the country for everything from installing, maintaining, and repairing ductwork, electrical systems and other building components to lifting workers to tend to signage and lighting. Many industries rely on the versatility of scissor lifts used in their day to day operations. Scissor lift operators are in demand nationwide and enjoy a rewarding and virtually recession-proof career. That’s all there is to it! CMO makes it fast and easy to complete scissor lift training and become an OSHA-compliant certified scissor lift operator. 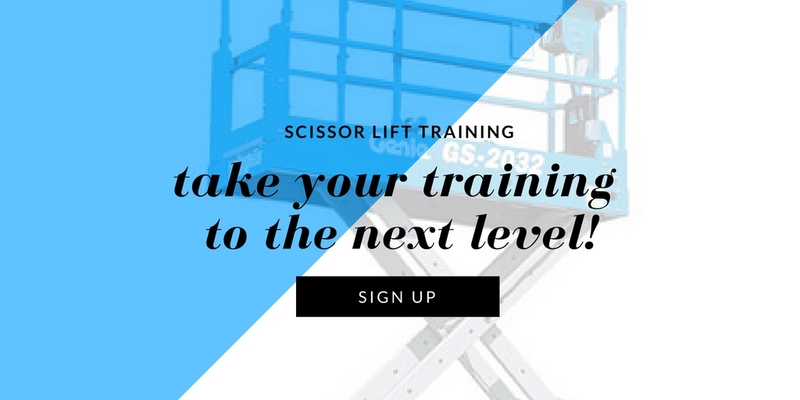 Our online, interactive training takes the headache out of becoming a certified scissor lift operator. We’ll provide everything you need to comply with OSHA requirements in a simple, easy to use, same day certification program. The scissor lift certification course from CertifyMeOnline.net is fast, easy and affordable. Workers print copies of their Scissor Lift Operator’s Certification Cards immediately after completing the program, which is proof of their having passed OSHA-approved scissor lift operator training. CMO’s online scissor lift certification training is simple to navigate and can be accessed using a smartphone, tablet, or laptop anywhere there’s an Internet connection. No special skills are required. OSHA makes it the employers responsibility to see that all scissor lift operator are properly trained and certified. In about an hour, workers can finish CMO’s OSHA-approved scissor lift operator training course. Using a smartphone or other digital device, employees can complete their training any time and anywhere there’s an Internet connection. It’s never been faster, easier or more convenient for your company to become OSHA compliant by having your workers complete our scissor lift certification program. What’s more, there’s no charge for the renewal training OSHA requires every three years. CMO is your best choice for fast and affordable scissor lift operator certification. Why wait? Get started today or call us at 602-277-0615 for more information or to find out about our group rates. All it takes is just five easy steps for your company and your employees to become OSHA compliant!